Resilience (of the right things) seems self-evidently valuable, but is it more than a buzzword? If so, how do we put it into practice? What exactly do we do for people, systems and organizations to help them become resilient? And how do we measure the progress of our efforts? These are trenchant questions. If resilience is to have real and lasting utility, we need models for it that can guide action, that can be rigorously characterized, implemented and measured and that are portable (within reason) from one circumstance to the next. Before proposing any such model, however, we must acknowledge a complicated semantic mess. Today, the term “resilience” is used in a number of different, and sometimes conflicting ways: first, to signify a cultural and personal value in the society at large (one with a presumed, particular resonance in the American psyche); second, as a neutral property of systems and people (a usage that suggests that a given characteristic might be perversely resilient as much as positively so); and finally, as an affirmative goal in the face of risk, in domains as diverse as urban planning, climate adaptation, organizational design, psychology and disaster response, to name just a few. Amid this thicket of sometimes-divergent, sometimes-overlapping contexts, parties often use the same words to mean different things, and different words to mean the same thing. To avoid confusion, we must carefully situate ourselves, and declare and limit the scope of our interests. Suitably, in this essay I’ll be referring to resilience in the “property of systems and people” context noted above, to describe the (mostly) beneficial ability to persist, recover or even thrive amid disruption. Below is a simplified model of resilience, inspired by principles articulated by the Danish systems researcher Erik Hollnagel, that decomposes the concept into four, concurrent clusters of verbs — the things that constitute the “doing” of resilience. 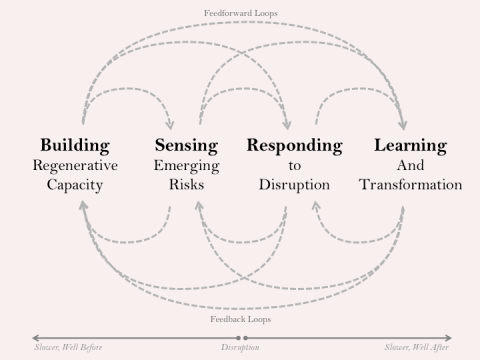 The clusters are focused on building regenerative capacity, sensing emerging risks, responding to disruption, and learning and transformation. Whether in a city, a group of neurons, a social-ecological system, a community or even a person, resilience is often found in context-specific variations of these activities. Like any high-level framework, the above model sacrifices some nuanced truths for broader ones. It is not intended to express every detail, but to help us to explore common processes, linkages, metaphors and tradeoffs found in many circumstances. This model posits moderate disruptions as a necessary, if painful mechanism by which systems are tempered, adapt, learn and reorganize. A resilient system isn’t one in which failures never occur; it’s one in which disruptions engender a healthy response — one which enables a system to “bounce forward” as much as bounce back. It is further assumed that there are epistemic constraints – limits to what we can know and prepare for in advance – and that surprises are inevitable, and that we’ll make mistakes. Another important feature of the framework is concurrency — a truly resilient system (or community, or person) is engaged in all of these activities all the time, albeit with different emphasis from moment to moment. Each activity influences the whole; it’s the connections between these activities that imbue the system with dynamism and adaptability. The first “cluster” of activities in the framework is focused on building regenerative capacity. This is typically comprised of longer-term, slower processes of healthy growth and regrowth. In a community, for example, its relevant verbs might include creating access to shared resources, fostering entrepreneurialism and personal freedom, ensuring access to learning, training and education, promoting good local governance, healthy institutions and strong social networks, affirming social coherence, social memory, trust and cooperation, nurturing tolerance for diversity, and reinforcing mechanisms for meaning-making and healing. At its pinnacle, such capacity expresses itself as creativity, imagination and foresight — the ability to improvise, envision new and different arrangements, and to rehearse for an uncertain future. These are the sorts of competencies that are essential for thriving, livable and healthy communities — and they’re also the ones that help ensure an adroit response to disruptions when they occur. Indeed, when these capacities are present, what might at first appear to be an impoverished community may, under duress, show surprising resilience. When they are absent, even an apparently wealthy community may demonstrate surprising fragility. An analogous set of capacity-building processes occurs in many natural systems. Healthy ecosystems are comprised of complex interactions between species, shaped by competition and reciprocity, and moderated by geophysical cycles. Together these interactions, and their corresponding nutrient flows, enable the ecosystem to function, and to produce (and reproduce, when needed) abundant natural capital. When an ecosystem’s functions are well — and diversely — met, not only does the ecosystem flourish — it can often cope with even severe disruptions and recover. However, when those same functions are poorly or narrowly fulfilled, the ecosystem becomes more fragile, and may be readily tipped past a threshold where healthy regrowth can no longer occur. Human societies have long relied on the regenerative aspect of ecosystems as a self-replenishing form of infrastructure. That’s one reason why, for example, the loss of wetlands and oysterbeds in coastal estuaries has drawn so much concern in recent years: these systems provide self-repairing, extreme-weather “shock absorbers” for the human (often urban) settlements to which they are connected. Their absence concentrates and amplifies the destructive power of storms like Katrina and Sandy. Regenerative capacity building not only happens at the grand scales of societies and ecosystems, but also at the most intimate levels of our human psyche. It is the continuous product of our skillful learning, and the result of our overcoming moderate life stressors on our way to greater levels of self-mastery, self-confidence and belonging. When we develop this kind of capacity, greater agency and self-advocacy follow, along with deepened senses of mindfulness, creativity and reciprocity that are key to personal resilience. Without such capacity building, many of these same qualities can wither, replaced by a sense of worthlessness, dependency and a loss of stakes in the future. In all three contexts — communities, ecosystems and individuals — we must seek to understand the health — or apithology — of each of the underlying systems that produce capacity, not just the capacity present in the system at a given moment in time. It is not trust, but the capacity for creating trust; not ecological integrity, but the mechanisms for producing and restoring it; not learning, but the systems that ensure people’s access and engagement with it that we must understand, measure and encourage to build resilience. Also, many of these capacity-building [OW1] mechanisms are deeply entwined and can’t be addressed in isolation. Certainly, for a time, wealth might be created through the exploitation of some cache of natural capital, or through the labors of marginalized people, but over the long-term, predicating capacity building in one domain on its systematic erosion in another simply moves fragility from one place to another. Our first step in building social and systemic resilience is to map, measure and encourage these underlying healthy, generative and restorative processes that operate when the system is undisturbed. The second “cluster” of activities in the model is sensing emerging risks. Here we ask: how do we instrument a person, a community, a social-ecological-system or a city to listen for change? Listening requires us to attend to signals, and some of those are as old as life itself. In an ecosystem, dramatic change may be foreshadowed by a subtle shift in the behavior of a key species, or in longstanding ecological rhythms. In communities, new economic patterns, the spread of certain behaviors, or even new modes of artistic expression may suggest the same. Attending to these kinds of changes is a craft as sophisticated and subtle as the changes being listened for — a skill that requires us to be fully present, and to listen closely without judgment. In more contemporary systems, new innovations in sensors, data science, and informatics provide us with powerful new ways to listen for change, whether through distributed devices that help civic leaders better see and manage urban flows, crowd-sourced crisis-response platforms that help citizens self-organize in the face of disaster, or satellite imagery that measures the human footprint. These tools not only sense new kinds of phenomena, but produce novel, hybrid indicators — letting us see how, for instance, a change in patterns of mobile phone usage might presage a shift in the economic or physical health of a community, or make clear how a shift in food prices might correlate with a spike in political unrest. Whether technologically mediated or not, this kind of sensing works by making the invisible visible. Sometimes, this process uncovers aspects of reality that were previously inaccessible; other times it reveals facts that were more intentionally obscured. Either way, it brings us closer to reality, and closer to the truth, which is the first step toward greater engagement and resilience. For we can’t mitigate, adapt to, or resist what we cannot see. Of course, we must also understand what we see, which requires specialized interpretive abilities that are still not widely distributed. Thankfully, new organizations are rising to help promote data literacy in the kinds of organizations that care for vulnerable people, communities and systems. Particularly in such contexts, its not just literacy, but data ethics that must also be a paramount concern. Systems scientists are also identifying new kinds of signals that might presage a disturbance. For example, just before a disruption occurs, many systems may experience synchrony, as agents within them briefly behave in lockstep just before being thrown into chaos. Synchrony can be seen in the brain cells of epileptics, for example, minutes before the onset of a seizure, and it was evident in the financial markets prior to the financial crash of 2008. Conversely, before a threshold is breached, systems may also manifest a phenomenon called critical slowing, becoming unstable and having difficulty returning to equilibrium. Both synchrony and critical slowing are examples of outlier levels of volatility — either too much or too little — that may portend disruption. To be clear: We will never be able to detect every signal among the noise, nor can we even be sure we will know, beforehand, what we should be listening for. Some disruptions will arrive with little warning, and some can’t be listened for at all. Even so, undertaken in the proper spirit, efforts to sense emerging risks can be their own form of capacity building. That’s because listening for any form of change promotes mindsets and relationships that are essential to responding to every form of change. In any such effort, most of the important questions are sociological, not technological: How do we pick the right signals to listen for? Who does the listening? How do we decide the threshold at which a signal should be actionable? How do we safeguard against false positives? How do we ensure signals will be heeded — particularly when doing so might be unpalatable for a particular interest group? How do we certify that the information contained in such signals is used respectfully and inclusively, and not as a tool to further amplify underlying inequities? How can we be confident of our own ability to respond to change? Answering these questions takes more than getting good and timely data — it requires us to develop a whole portfolio of tools, activities and processes for paying sustained attention to potential disruptions, engaging the right stakeholders and institutions, developing a shared sense of the consequences and taking appropriate actions. Effective sensing also requires two closely aligned, subsidiary skills: the ability to anticipate new potential risks, and to rehearse our responses to them in advance. Anticipation and rehearsal are strengthened through exercises like war games, preparedness drills, scenario-based exercises, and, increasingly, serious games. All of these are designed to improve decision making under uncertainty, and to encourage us to eliminate foreseeable risks where possible, and to mitigate the impacts of risks that cannot be avoided. It’s worth noting here that our own cognitive biases play a significant, typically limiting role in our ability to sense and socialize emerging risks. As psychologist Dan Gilbert has pointed out, human beings are extremely attentive to short-term, quickly-moving, narrative, personified threats, particularly those, like terrorism, that involve the breaking of a moral taboo. We are far less responsive to slow moving, more abstract and less narrative forms of change, like climate change or growing income inequality. This is why storytelling is also a vital part of sensing and socializing emerging risk. Stories dramatize less obvious, but no less impactful forms of change to which human beings are less naturally sensitive, and can help build context and momentum for action. Increasingly, we need the ability to build and tell stories with data. As we can see, “sensing emerging risks” comprises a whole suite of verbs: assessing risks, establishing mechanisms for listening, interpreting potential signifiers of change, ensuring that these signals are properly understood, building processes for anticipation, rehearsal, and storytelling, and, when necessary, taking appropriate action. The third “cluster” in the model is responding to disruption. Here we ask, how do we ensure a person, a community or a system responds and recovers effectively after an unforeseen shock? It should go without saying that a healthy response to disruption such as a natural disaster requires timely delivery of material, information and support, delivered in as inclusive and efficient a way as possible. This support is not only essential in its own right, but sends a strong signal of care, concern, dignity and respect. Yet there is also a direct correlation between the health of prior capacity building and risk-sensing practices, and the nature and quality of response to a disruption. Healthy communities, systems and people are far more likely to produce or participate in their own effective responses, rather than be wholly dependent on external help. For example, an analysis by the Associated Press-NORC Center for Public Affairs Research commissioned by the Rockefeller Foundation found that, other things being equal, communities that lacked trust and social cohesion recovered more slowly after Superstorm Sandy than did neighboring communities. That’s because trust and cohesion help us turn self-concern into empathy and compassion — to see ourselves in the other — which in turn helps promote mutual aid when it’s needed most. This cooperative dynamic shapes our responses in other, subtler ways, too. In numerous field experiences, the most effective responses to disruptions we’ve encountered are not fully-rehearsed, off-the-shelf recovery plans from formal institutions, but rather adhocratic responses comprised of a mix of public and private efforts from local, national and international organizations, informal social networks, government agencies, volunteers and citizens, social innovators and technology platforms, all working together in highly improvisational, spontaneous, and self-organized ways. Each disruption and circumstance is unique, and there is no prefabricated organizational chart for the players — indeed, one of their first tasks is to create it. Adhocracy is characterized by informal team roles, limited focus on standard operating procedures, deep improvisation, rapid cycles, selective decentralization, the empowerment of specialist teams and a general intolerance of bureaucracy. It’s well suited to the earliest moments of response to a disruption, when you don’t know exactly what you’re dealing with, and a valuable complement during subsequent recovery, when more standard operating procedures often take over. Technology can support healthy responses in several ways. First, digital technologies enable the dissemination of timely and accurate information, which is often the first casualty in a disruption, and the encouragement of appropriate behaviors. It allows for the discovery of services, the coordination of both self-organization and external support, and the allocation of resources to the places that they’re needed most. Digital services that deliver such services are increasingly interoperable, enabling rapid, plug-and-play, Lego-like development of tools that provide just the services that are needed in a given circumstance. This is all well and good, as long as we have the electricity and connectivity needed to power them – and that’s the second area where technology has an important role to play. As part of a ‘micro-everything’ revolution, engineers have been developing small-scale, rapidly-deployable neighborhood-level utilities: portable microgrids that provide energy, and wireless mesh networks that provide communications and connectivity when more traditional systems fail. Finally, technology promises new ways to deploy productive capacity — the ability to make and produce assets where they’re needed most. Although still rapidly evolving, distributed manufacturing via 3D printing and “fablabs” will certainly be used in the future to help a community produce some of the assets it needs, before, during and after a disruption, right on the spot. Of course, it’s not just the infrastructure we care about most in a disruption – it’s the people. In a recurring motif, many forms of personal capacity developed before a disruption shape our individual ability to cope and respond after it strikes. Psychosocial resilience has many correlates, including the strength of our social networks, our access to resources, the quality of our most intimate, pair-bonded relationships, our physical health (particularly our brain health), our beliefs and our habits of mind. Many of these can be encouraged: in particular, mindfulness practices, even those taught after a disruption, have been shown to dramatically improve emotional self-regulation, and limit the long-term, damaging psychological (and physiological) effects of high-stress circumstances. Many people also find restoration and resilience through commemoration and healing rituals, and engagement with the natural world. Unfortunately, stress doesn’t just come from the loss and grief that are often associated with disruption — it can also come from prolonged exposure to the bureaucracy that accretes in its aftermath. In the transition to recovery, competing interests and murky jurisdictional issues create a morass of complexity and red tape — the experience of which can rival the initial disruption in its stressfulness and disorientation. We can and must redesign the interface between individuals and institutions involved in response and recovery. These capacities, of adhocratic cooperation, improvisation and self-organization; timely and effective dissemination of information; attendance to not just the physical but the psychosocial dimensions of response; and the redesign of bureaucratic interactions are all fruitful places where we can amplify the effectiveness of response. The final cluster in the model is Learning and Transformation. Here we ask: How do we effectively learn from disruptions? When do we decide to gird a system against future risks, and when do we decide to transform it altogether? If disruptions are the mechanisms by which systems learn, adapt and grow, we must ensure we take the right lessons from them. That requires putting in place inclusive processes for honest analysis, reflection and, when needed, structural change. It is generally accepted among environmental geographers that there is no such thing as a natural disaster. In every phase and aspect of a disaster — causes, vulnerability, preparedness, results and response, and reconstruction — the contours of disaster and the difference between who lives and who dies is to a greater or lesser extent a social calculus. This observation provokes a host of questions: when should we decide to improve the resilience of a vulnerable community, and when should we decide that their vulnerability is morally unacceptable, and then work to transform the system altogether? Who should decide such a thing? On what basis? And by what means? For example, during Superstorm Sandy, low-income public housing units, many of them located on previously undesirable plots of land on what was once a working waterfront, flooded, ruining the boilers that provide heat and hot water to residents. Is the proper response to flood-proof the basement, move the boilers to the roof, or to decide that concentrating vulnerable people in flood-prone areas is no longer an option? Another example: in many other parts of the world, smallholder farmers, who tend tiny plots of land, do most of the farming. These farmers work in near-subsistence conditions, have extremely low labor costs, and face significant risks from a changing climate — they are sometimes only one extreme weather event away from disaster. Is the best response to this to insure these farmers financially against climate volatility? Or to rethink the smallholder system altogether? These questions are ones, ultimately, of framing and politics, and there are no obvious answers. They highlight unavoidable tensions between the need for social cohesion, inclusive decision making and the need for sometimes unpalatable forms of risk mitigation, even if they lead to positive, even transformational outcomes. The success of such efforts rests not just on post-mortems, but also on inclusive coalition-building, strong formal and informal governance, and credible leadership. All of these things need to be in place for learning and transformation to occur. Each of these four clusters – and the linkages between them – represent important places where we might intervene to improve resilience. Of course, the verbs in each will always be context-specific, and we may never be able to understand all of the dynamics beforehand. This is why we must embrace what F. David Peat calls ‘gentle action’ – spending as much time as possible understanding and illuminating a system, designing reversible interventions and experiments ‘with, not for’ its stakeholders, before embracing larger wholesale change. It should be clear that, human (and technological) energies being finite, there will also be tradeoffs between how much we can invest in any of the activities presented above. In some communities, we may find strong regenerative capacity, but little ability to listen for change. In others, we may find strong response mechanisms, but little capacity for anticipating new forms of risk. To build resilience is to work in the shadow of the system’s dominant capacities and culture, strengthening its weaker elements. Third, timing matters. 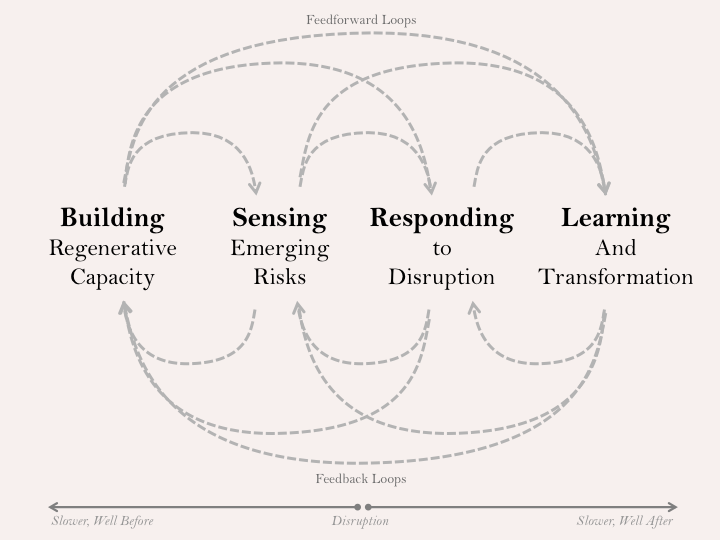 In this model, the “outer” processes — of building regenerative capacity and learning and transformation — are slower than the “inner” processes of sensing emerging risks and responding to change. Because it takes time for the system to recover and adapt, it is the cadence, not just the severity of disruptions, which shapes resilience. Moderate disruptions, moderately spaced, may keep the system in a place of healthy response and renewal. More frequently spaced, their effects can accumulate and become a system’s undoing. This model has resonated with researchers and practitioners in a wide variety of resilience-related fields, and, excitingly, with citizens and community members as well. It has demonstrated its value as a framework for comparing approaches and strategies found in different contexts, as a powerful way to get new people into the resilience discussion and to widen the aperture of the resulting dialogue. Feedback on it is welcome!